MJ Fire Safety are safety signage specialists. As part of our maintenance and testing of fire systems and appliances and as part of our risk assessment compliance service we have to know the signage regulations inside out. We are approved distributors of Jalite photoluminescent signs & we also supply and fit a huge range of other safety signage. Furthermore we supply and fit a comprehensive range of signs in different materials. These range from rigid plastic & self adhesive signs, brushed gold & silver signs to aluminium and stainless steel signs. We provide our diverse range of clients a complete service in all business sectors from schools & universities to galleries, restaurants and building sites. Therefore whatever your signage requirement, MJ Fire Safety can provide the solution. We work closely with our customers and fire risk assessors so that regulations and legislative requirements are met. In addition we also ensure that the final finish and installation of signage is completed to a high standard. 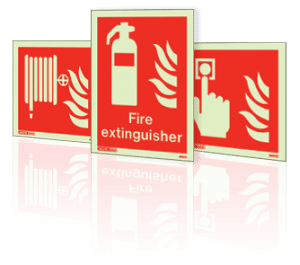 All photoluminescent fire safety signage supplied meets the requirements of ISO 7010: 2011 graphical symbols — safety colours & safety signs regulations. In addition they meet BS5499 part 4 2013 and part 10 2014 requirements. If you require a quotation or site survey please contact us. We would be happy to help.